For the ancient settlement at Luxor, see Thebes, Egypt. For other uses, see Luxor (disambiguation). 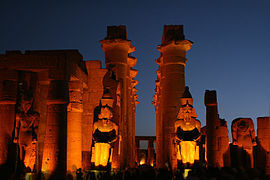 Luxor (/ˈlʌksɔːr, ˈlʊk-/; Arabic: الأقصر‎ al-Uqṣur ; Egyptian Arabic: Loʔṣor [ˈloʔsˤoɾ]; Sa'idi Arabic: Logṣor [ˈloɡsˤor], Coptic: ⲛⲏ) is a city in Upper (southern) Egypt and the capital of Luxor Governorate. 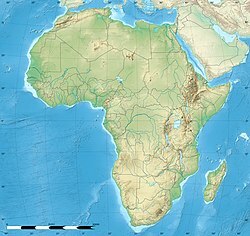 The population numbers 506,588 (2012 estimate), with an area of approximately 417 square kilometres (161 sq mi). 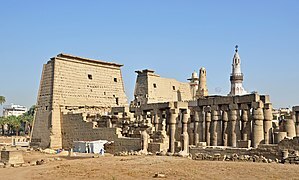 As the site of the Ancient Egyptian city of Waset, known to the Greeks as Thebes, Luxor has frequently been characterized as the "world's greatest open-air museum", as the ruins of the temple complexes at Karnak and Luxor stand within the modern city. Immediately opposite, across the River Nile, lie the monuments, temples and tombs of the West Bank Necropolis, which includes the Valley of the Kings and Valley of the Queens. The name Luxor comes from the Arabic al-ʾuqṣur (الأقصر), lit. "the palaces", from the collective plural of qaṣr (قصر), which may be a loanword from the Latin castrum "fortified camp". Luxor was the ancient city of Thebes, the great capital of (Upper) Egypt during the New Kingdom, and the glorious city of Amun, later to become the god Amun-Ra. The city was regarded in the Ancient Egyptian texts as wꜣs.t (approximate pronunciation: "Waset"), which meant "city of the sceptre", and also as tꜣ ı͗pꜣt (conventionally pronounced as "ta ipet" and meaning "the shrine") and then, in a later period, the Greeks called it Thebai and the Romans after them Thebae. Thebes was also known as "the city of the 100 gates", sometimes being called "southern Heliopolis" ('Iunu-shemaa' in Ancient Egyptian), to distinguish it from the city of Iunu or Heliopolis, the main place of worship for the god Ra in the north. It was also often referred to as niw.t, which simply means "city", and was one of only three cities in Egypt for which this noun was used (the other two were Memphis and Heliopolis); it was also called niw.t rst, "southern city", as the southernmost of them. The importance of the city started as early as the 11th Dynasty, when the town grew into a thriving city. Montuhotep II who united Egypt after the troubles of the first intermediate period brought stability to the lands as the city grew in stature. The Pharaohs of the New Kingdom in their expeditions to Kush, in today's northern Sudan, and to the lands of Canaan, Phoenicia and Syria saw the city accumulate great wealth and rose to prominence, even on a world scale. Thebes played a major role in expelling the invading forces of the Hyksos from Upper Egypt, and from the time of the 18th Dynasty to the 20th Dynasty, the city had risen as the political, religious and military capital of Ancient Egypt. The city attracted peoples such as the Babylonians, the Mitanni, the Hittites of Anatolia (modern-day Turkey), the Canaanites of Ugarit, the Phoenicians of Byblos and Tyre, the Minoans from the island of Crete. A Hittite prince from Anatolia even came to marry with the widow of Tutankhamun, Ankhesenamun. 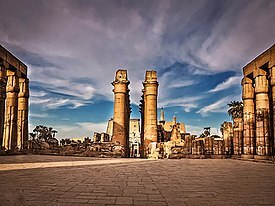 The political and military importance of the city, however, faded during the Late Period, with Thebes being replaced as political capital by several cities in Northern Egypt, such as Bubastis, Sais and finally Alexandria. However, as the city of the god Amun-Ra, Thebes remained the religious capital of Egypt until the Greek period. The main god of the city was Amun, who was worshipped together with his wife, the Goddess Mut, and their son Khonsu, the God of the moon. With the rise of Thebes as the foremost city of Egypt, the local god Amon rose in importance as well and became linked to the sun god Ra, thus creating the new 'king of gods' Amon-Ra. 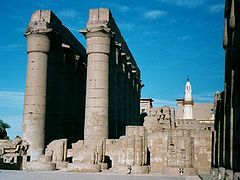 His great temple, at Karnak just north of Thebes, was the most important temple of Egypt right until the end of antiquity. Later, the city was attacked by Assyrian emperor Assurbanipal who installed the Libyan prince on the throne, Psamtik I. The city of Thebes was in ruins and fell in significance. However, Alexander the Great did arrive at the temple of Amun, where the statue of the god was transferred from Karnak during the Opet Festival, the great religious feast. Thebes remained a site of spirituality up to the Christian era, and attracted numerous Christian monks in the Roman Empire who established monasteries amidst several ancient monuments including the temple of Hatshepsut, now called Deir el-Bahri ("the northern monastery"). Luxor has a hot desert climate (Köppen climate classification BWh) like the rest of Egypt. Aswan and Luxor have the hottest summer days of any other city in Egypt. Aswan and Luxor have nearly the same climate. Luxor is one of the sunniest and driest cities in the world. Average high temperatures are above 40 °C (104 °F) during summer (June, July, August) During the coldest month of the year, average high temperatures remain above 22 °C (71.6 °F) while average low temperatures remain above 5 °C (41 °F). The climate of Luxor has precipitation levels lower than even most other places in the Sahara, with less than 1 mm (0.04 in) of average annual precipitation. The desert city is one of the driest ones in the world, and rainfall does not occur every year. The air in Luxor is more humid than Aswan but still very dry. There is an average relative humidity of 39.9%, with a maximum mean of 57% during winter and a minimum mean of 27% during summer. 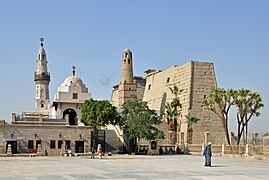 The Coptic Catholic (Alexandrian Rite) minority established on November 26, 1895 an Eparchy (Eastern Catholic Diocese) of Luqsor (Luxor) alias Thebes, on territory split off from the Apostolic Vicariate of Egypt. Its episcopal see is a St. George cathedral in Luxor. In turn, it lost territory on August 10, 1947 to establish the Eparchy of Assiut and again on 14 September 1981 to establish Sohag. 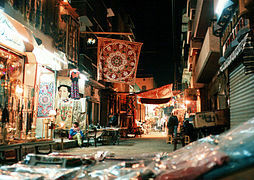 The economy of Luxor, like that of many other Egyptian cities, is heavily dependent upon tourism. Large numbers of people also work in agriculture, particularly sugarcane,There are also many industries, such as the pottery industry used in eating and many other uses. The local economy was hit by the Luxor massacre in 1997, in which a total of 64 people (including 59 visiting tourists) were killed, at the time the worst terrorist attack in Egypt (before the Sharm el-Sheikh terrorist attacks). The massacre reduced tourist numbers for several years. Following the 2011 Arab Spring, tourism to Egypt dropped significantly, again affecting local tourist markets. A controversial tourism development plan aims to transform Luxor into a vast open-air museum. The master plan envisions new roads, five-star hotels, glitzy shops, and an IMAX theatre. The main attraction is an 11 million dollar project to unearth and restore the 2.7 kilometres (1.7 miles) long Avenue of Sphinxes that once linked Luxor and Karnak temples. The ancient processional road was built by the pharaoh Amenhotep III and took its final form under Nectanebo I in 400 BCE. Over a thousand sphinx statues lined the road now being excavated which was covered by silt, homes, mosques and churches. Excavation started around 2004. On 18 April 2019, the Egyptian Government announced the discovery of a previously unopened coffin in Luxor, dated back to 18th dynasty of Upper and Lower Egypt. According to the Minister of Antiquities Khaled el Anani, it is the biggest rock-cut tomb to be unearthed in the ancient city of Thebes. It is one of the largest, well-preserved tombs ever found near the ancient city of Luxor. On 24 November 2018, this discovery was preceeded by the finding of a well-preserved mummy of a woman inside a previously unopened coffin dating back more than 3.000 years..
Nineteen Asian and European tourists died when a hot air balloon crashed early on Tuesday, February 26, 2013 near Luxor following a mid-air gas explosion. It was one of the worst accidents involving tourists in Egypt and likely to push the tourism industry deeper into recession. The casualties included French, British, Hungarian, Japanese nationals and nine tourists from Hong Kong. 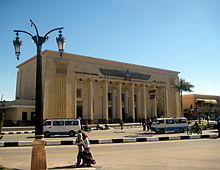 Luxor is served by Luxor International Airport. 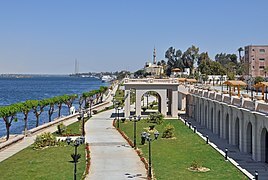 A bridge was opened in 1998, a few kilometres upstream of the main town of Luxor, allowing ready land access from the east bank to the west bank. Traditionally, however, river crossings have been the domain of several ferry services. The so-called 'local ferry' (also known as the 'National Ferry') continues to operate from a landing opposite the Temple of Luxor. Transport to sites on the west bank are serviced by taxi drivers who often approach ferry passengers. There are also local cars that reach some of the monuments for 25 piasters, although tourists rarely use them. Alternatively, motorboats line both banks of the Nile all day providing a quicker, but more expensive (5 L.E. ), crossing to the other side. 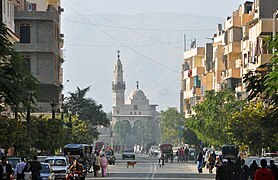 The city of Luxor on the east bank has several bus routes used mainly by locals. Tourists often rely on horse carriages, called "calèches", for transport or tours around the city. Taxis are plentiful, and reasonably priced, and since the government has decreed that taxis older than 20 years will not be relicensed, there are many modern air-conditioned cabs. Recently, new roads have been built in the city to cope with the growth in traffic. For domestic travel along the route of the Nile, a rail service operates several times a day. A morning train and sleeping train can be taken from the railway station situated around 400 metres (440 yd) from Luxor Temple. 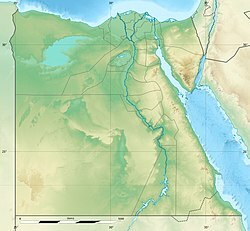 The line runs between several major destinations, including Cairo to the north and Aswan to the south. ^ Macmillan & Co (1905). Guide to Egypt and the Sudan: Including a Description of the Route Through Uganda to Mombasa. Macmillan. pp. 115–. ^ Shahîd, Irfan (2002) Byzantium and the Arabs in the Sixth Century Washington, D.C.: Dumbarton Oaks Research Library and Collection. ISBN 9780884022848. page 68. ^ a b c d e f g h "History of Luxor (Thebes)". Sacred Destinations. Archived from the original on October 13, 2008. Retrieved December 1, 2008. ^ "Luxor, Egypt". Voodoo Skies. Retrieved June 21, 2013. ^ "Luxor Climate Normals 1961–1990". National Oceanic and Atmospheric Administration. Retrieved January 25, 2015. ^ "Luxor Climate and Weather Averages, Egypt". Weather2Travel. Retrieved August 15, 2013. ^ McGrath, Cam (June 16, 2011). "Mideast: Sphinx Avenue Paved With Bitter Memories — Global Issues". Globalissues.org. Retrieved September 16, 2011. ^ McGrath, Cam (June 16, 2011). "Mideast: Sphinx Avenue Paved With Bitter Memories — Global Issues". Globalissues.org. Archived from the original on November 9, 2016. Retrieved September 16, 2011. ^ "Expansive New Kingdom tomb unveiled in Egypt's Luxor". reuters.com. April 18, 2019. Archived from the original on April 18, 2019. 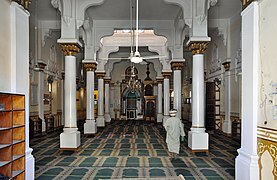 ^ Mustafa Marie (April 18, 2019). "Egypt announces tomb discovery at Luxor's Draa Abul Naga necropolis". Archived from the original on April 18, 2019. ^ "Ancient Egyptian Mayor's Tomb Discovered in Luxor (with video)". luxortimes.com. April 18, 2019. Archived from the original on April 18, 2019. ^ "'Astonishing' 3,500-year-old Egyptian tombs discovered in Luxor". ctyvnews.ca. April 18, 2019. Archived from the original on April 18, 2019. ^ "Egyptian archaeologists unveil newly discovered Luxor tombs". telegraph.co.uk. November 24, 2018. Archived from the original on November 24, 2018. ^ Randa Ali (November 26, 2018). "13th century priest's tomb discovered in Egypt's Luxor". abcnews.go.com. Archived from the original on November 26, 2018. ^ "Baltimore City Mayor's Office of International and Immigrant Affairs - Sister Cities Program". Archived from the original on August 7, 2008. Retrieved July 18, 2009. ^ "Georgia's wine region twins with Egypt's Luxor". Agenda.ge. March 11, 2015. Retrieved April 2, 2015. Bell, Lanny. “Luxor Temple and the Cult of the Royal ka.” Journal of Near Eastern Studies 44 (1985): 251–294. Brand, Peter J. “Veils, Votives and Marginalia: The Use of Sacred Space at Karnak and Luxor.” In Sacred Space and Sacred Function in Ancient Thebes. Edited by Peter F. Dorman and Betsy N. Bryan, 51–83. Chicago: University of Chicago Press, 2007. El-Shahawy, Abeer, and Farid S. Atiya. Luxor Museum: The Glory of Ancient Thebes. Cairo, Egypt: Farid Atiya Press, 2005. Haag, Michael. Luxor Illustrated: With Aswan, Abu Simbel, and the Nile. Cairo: American University in Cairo Press, 2009. Siliotti, Alberto. Luxor, Karnak, and the Theban Temples. Cairo: American University in Cairo Press, 2002. Strudwick, Nigel, and Helen Strudwick. Thebes In Egypt: A Guide to the Tombs and Temples of Ancient Luxor. Ithaca, NY: Cornell University Press, 1999. Weeks, Kent R. The Illustrated Guide to Luxor: Tombs, Temples, and Museums. Cairo, Egypt: American University in Cairo Press, 2005. 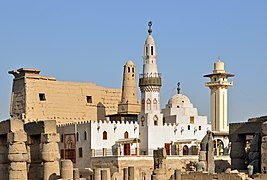 Wikivoyage has a travel guide for Luxor. Kamil, Jill (November 2008). "The Development Plan for Luxor". Al-Ahram Weekly, Issue No. 921. Archived from the original on August 6, 2009.